In an attempt to get caught up here on the blog, I had intended to re-wear old favorite outfits for the next few weeks. Instead, as I often can't help doing, I started experimenting with some casual outfit options for a what was going to be an usually casual Friday. What inspired me was this past favorite outfit (one I considered re-wearing), but I wanted to incorporate my mint ankle pants - as of yet unworn - instead. Stripes, jacket, belt, heels - it was a combination I really liked and thought I wore well! So bring on the mint ankle pants. 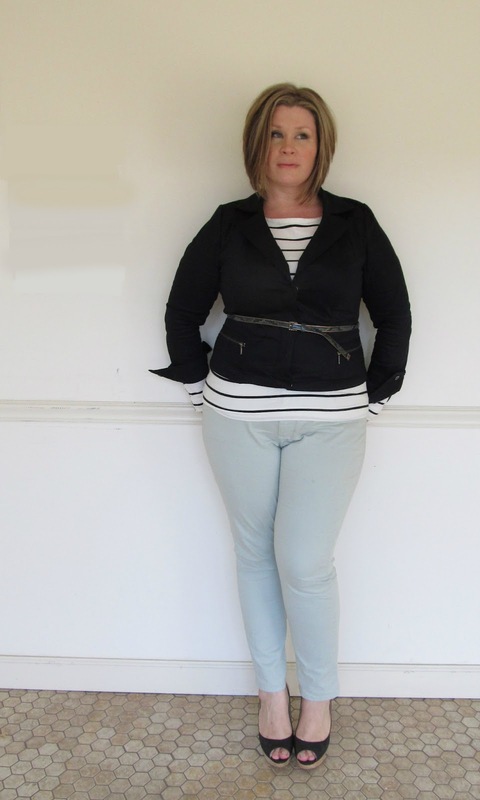 The striped top has great button detailing along the sleeve, so I simply couldn't allow the jacket to cover it up! The cuffs of the jacket look a bit exaggerated, but I kinda like the effect. I also thought I wouldn't like the very pale, washed-out color palette, but once I tried on the whole outfit, I was surprised by how much that was exactly what I liked the most. The whole look is a clean, minimal one, and it's pretty much my favorite way to wear, well, anything. I must admit that I continue to feel little self-conscious in these light-colored skinnies, but as I walked passed a entire wall of mirrors at work, I forced my thoughts from "Ew" to "This is my body, and I'm just gonna work it. And like it." I'd like to think it wasn't a fleeting thought. tempts me to try ankle pants...but I could not wear them as well as you. You look amazing! love this outfit! did you lose weight - you look great! thanks! it's a never fail combo, really! oh i'm sure you could! it's mostly just about proportion and, well, embracing your shape! You really look great in the pants. I think they would look super hot with boots this winter. Hope you have more brave days and wear them some more! Wow you look great! This outfit is so flattering. Love it! I'm with the other comments -- I looked at this the other day, distracting myself from being home from work due to Sandy -- and I wondered how long it had been (only a few days) since I'd seen your posts. Because you looked like you just lost 10 lbs. Not that you needed to. You look fantastic. And I am so ready to brave ankle length skinnies now!! Thank you! I look forward to your posts. Hope you kick that insomnia soon!